Zenith 75 WSP Insecticide delivers superior broad spectrum control of many ornamental and turf insects. Zenith 75 WSP contains the active ingredient, Imidacloprid, which is the same in Merit insecticide. This product will provide season long control with just one easy application. This is also a great preventative because it stops the egg laying action of your targeted pests. Examples of sites to be used on: Turf- golf courses, parks, cemeteries, playgrounds, home lawns, athletic fields, shopping complexies, and sod farms. Can be used on ornamentals on residential, commercial landscapes and interior plantscapes. 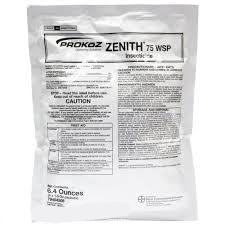 Zenith 75 WSP comes in an easy to use water soluble packet and can be tank mixed with most liquid fertilizers, fungicides, miticides, and other common insecticides. Has a low use rate which means less hazard to you and non target organisms. This package contains four (4) 1.6 oz packets. Great buy. Not for sale in NY.